The Cleveland Veterans Affairs Medical Center discovered via a routine nasal swab that a quadriplegic patient was colonized with MRSA; the patient had not had any signs that would have indicated an infection. To satisfy their curiosity over how much MRSA a healthcare worker might pick up from a patient whom they did not know was colonized, they had a health care worker do an abdominal exam of the patient — let's underline that: abdominal; nowhere near his nose. Then they pressed the worker's hand onto a growth medium that had been tuned with antibiotics so that it would allow MRSA to grow but suppress other bacteria. That's what you're looking at above. All of that red is MRSA. The image on the right is what grew after the same worker did hand-sanitizing with alcohol foam and then pressed the same hand onto an identical culture plate. What's growing? Nothing at all. A 24-year-old man who had quadriplegia due to a traumatic spinal cord injury was found on routine surveillance cultures to have methicillin-resistant Staphylococcus aureus (MRSA) colonization of his anterior nares. He had no history of MRSA infection or colonization. To assess the potential implications of the patient's MRSA carriage for infection control, an imprint of a health care worker's ungloved hand was obtained for culture after the worker had performed an abdominal examination of the patient. 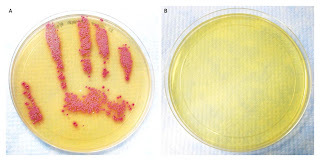 The MRSA colonies grown from this handprint on the plate (CHROMagar Staph aureus), which contained 6 µg of cefoxitin per milliliter to inhibit methicillin-susceptible S. aureus, are pink and show the outline of the worker's fingers and thumb (Panel A). With the use of a polymerase-chain-reaction assay, the mecA gene, which confers methicillin resistance, was amplified from nares and imprint isolates. After the worker's hand had been cleaned with alcohol foam, another hand imprint was obtained, and the resulting culture was negative for MRSA (Panel B). These images illustrate the critical importance of hand hygiene in caring for patients, including those not known to carry antibiotic-resistant pathogens. UPDATE: The tireless and too-seldom-thanked crew at ZoneGrippeAviare, who provide pandemic news for the Francophone community, have translated this post into French. Mes mercis respectueuses! 1917: Canadian microbiologist, Felix d'Herelle, discovers natural nanotechnology, bacteriophage therapy, that can cure and prevent superbug infections and foodborne bacterial disease. 2008: Canadians continue to suffer and die unnecssarily from superbug infections and foodborne disease because Canada is too venal to approve and use natural nanotchnology, bacteriophage therapy, discovered by Canadian microbiologist, Felix d'Herelle in 1917. While 8000 to 12000 Canadians are dying from antibiotic-resistant superbug infections annually the joke is on us, as some countries still practice technology discovered by the Canadian, Felix d'Herelle in 1917. Phage therapy uses highly specific viruses, bacteriophages, which are harmless for humans, to treat bacterial infections. Phage therapy is not currently approved or practised in Canada. According to a letter signed by a former federal health minister it can be made available legally to Canadians under the Special Access Program of our Food & Drugs Act! A discussion of phage therapy is currently very timely because of the release of the Canadian film: Killer Cure: The Amazing Adventures of Bacteriophage and the book by Thomas Haeusler entitled, Viruses vs. Superbugs, a solution to the antibiotics crisis? ( see http://www.bacteriophagetherapy.info ). Both references are available at Ottawa libraries. This file has dramatically changed because the US Food and Drug Administration has amended the US food additive regulations to provide for the safe use of a bacteriophages on ready-to-eat meat against Listeria monocytogenes (see http://www.fda.gov/OHRMS/DOCKETS/98fr/02f-0316-nfr0001.pdf ). Also http://www.cfsan.fda.gov/~dms/opabacqa.html . The idea that ready-to-eat meat can be treated if contaminated with Listeria bacteria while a doctor could not get a pharmaceutical grade phage therapy product when faced with a patient suffering listeriosis strikes this author as absurd especially considering the recent massive recall of ready-to-eat meat in Canada due to contamination with listeria. Information is available on phage therapy treatment in Georgia , Europe ( http://www.phagetherapycenter.com ), or Poland - ( http://www.aite.wroclaw.pl/phages/phages.html ) or more recently at the Wound Care Center, Lubbock, Texas ( http://www.woundcarecenter.net/ ) . Canada should establish 'The Superbug Victim Felix d'Herelle Memorial Center for Experimental Phage Therapy' to provide phage therapy to patients when antibiotics fail or when patients are allergic to antibiotics. Disclaimer: This information was produced as a public good. It is the opinion of the author based on extensive study of published literature and is considered a valid interpretation of that literature; however, readers are encouraged to study the references and additional literature to form their own opinion. This information may be referenced, used or quoted with or without giving credit to the author. It may be distributed, copied or stored by any means. Readers and users are responsible for any outcomes from any use of this information.